Lot’s of people pursue “vanlife” for different reasons. Some people do it for the weekend escape from 9-5 monotony, some have chosen to live a nomadic life for freedom or to save money, and others have fallen into vanlife, sometimes without intent, due to life and financial circumstances. This article is aimed squarely at fellow full-time or long-term travellers who also pursue paid employment while living and travelling in a van. EDIT: We just uploaded a video on our YouTube channel that also discusses this topic, if you prefer to watch/listen instead of read; CLICK HERE. Aside from fuel, registration, maintenance/repairs and insurance, living in a van is a very free and inexpensive alternative to paying rent or loan repayments for a traditional brick-and-mortar home. But, what happens when you want to stay in one area for an extended amount of time? Even people who work 100% online need or want to be in a particular location for work and lifestyle opportunities. Do you stealth camp/park on the streets, pay to rent a parking space on a private block of land, or go to a RV/caravan park? Choosing some of these options may result in your “free and easy” vanlife lifestyle suddenly becoming more expensive and complicated. The best way to maximise your enjoyment, freedom and savings capability is to reduce your spending as much as possible. While there’s all sorts of strategies to do this across all forms of spending – today we are talking specifically about avoiding or significantly minimising “rent” costs while living in your home on wheels. We have been living and working in a small tourist town in Western Australia, on and off, for the past 14 months. Our jobs include retail, office/design work and hospitality. We need to be close to town and available for often changing shifts, plus we need to be presentable and well-rested for these often demanding jobs. In order to achieve this, we have been testing out a variety of accommodation options to see what works for us best. Stealth camping/parking is the act of parking up our van in a public area, usually a quiet street or beach car park, in an area which generally doesn’t permit people to sleep in their vehicle; although, in our experience, it is rarely enforced. Since arriving in town we have kept an eye out for suitable locations for us to park overnight. We now have a collection of spots that we know are generally safe, quiet and where we do not (or have not) get hassled from local law enforcement. Generally these locations are in light commercial areas which are quiet and empty after 6pm. Most of these areas in Australia do not have overzealous security and the parking areas are normally not gated or secured. Although it isn’t always an attractive location, we always have these places as a backup option. We also occasionally park up next to a recreational area, forest or at a quiet beach car park. However these aren’t always ideal as law enforcement ramps up during the busy summer months; especially as fines in most Australian council areas range from $100 to $1000 if caught out. If we park in these areas we always check with locals first, or check Wikicamps for inside info. Another point is that we never stay in the same area for more than two nights in a row, so we do not attract attention to ourselves by locals or law enforcement. In summary, stealthing it isn’t ideal for long term stays in a small town, as people quickly get to know you and the vehicle. But it is an option as a stop-gap measure in between other options. We are very lucky that we have met and made local friends who have offered us to park up on their private property as needed. We have also met people who have large rural blocks of land near town who were willing to rent out a space for us to park and stay for a small contribution (around $50 to $80 a week for the two of us, utility bills included). It’s always a great idea to make an effort to chat with locals, and put it out there that you are looking for a spot to park up every so often. We have found most people to be open to the idea, especially since we have a self-contained van and we are quiet and respectful people. One thing to consider is that local by-laws often have prohibitions against parking a mobile home of any sort on private land for more than one or two weeks. Of course, they have to see you are there and send someone over to tell you to move on first, but it’s worth keeping in mind that this option may not be suitable for longer term stays. If the local authorities are really zealous about stealth camping, and you haven’t had any luck with finding a private bit of land to park on, another options is to stay at a local campground or RV/caravan park. Quality and prices of parks vary, so we have found it worth looking around to see what’s available near the town you want to stay in. Simply staying at a park is often quite expensive, as they cater for the holiday crowds during holiday seasons. It’s not uncommon to spend over $200 per week to stay at an unpowered site in popular tourist areas in Australia. Unless you are working a really well-paid job, this expensive, plus the cost of owning and maintaining your van, will become a read dead-weight. One solution we have found is to use HelpX, WWOOF or Work Away to find parks that are open to letting you stay long-term, in exchange for a negotiated amount of volunteer or paid work hours each week. This is what we did when we first arrived in town, committing six hours each per week of unpaid work in exchange for a spot to park our van, power, water, laundry and amenities, and access to hire bicycles. This arrangement was acceptable for a short amount of time, but admittedly doing twelve hours of unpaid work over three days each week, whilst also working other paid jobs, did get tiresome eventually. We stayed on though because we enjoyed the location and the company of the management and other workers. Eventually the ownership of the park changed, and we managed to keep our parking place and benefits, and also we paid industry rates for our work ($25+ per hour, and double that on public holidays). This made the arrangement much more palatable, although it was still difficult to juggle with our other jobs which also had always changing rosters. Since coming back to town for the new summer-autumn season we have avoided this option, and focussed on single jobs to make it easier to balance work-life commitments and rosters. It is still a good option to look into if you are having issues finding a place to stay. This is an option that we have been using more since we have come back for our second season of work in town, in lieu of staying at a camp ground. Generally it has been very successful, as we have lots of good references, a self-contained vehicle, and believe that we present ourselves as responsible and trustworthy in our advertisements. The peak holiday season (December to early February) is when this option works best, as many people leave for holidays for two or more weeks. House sitting has allowed us to stay in some really beautiful and unique houses and areas around town, places that we probably would have never visited if it wasn’t for our house sit gig. It also allows us a quiet, private space to do upgrades and maintenance on the van, clean the van, and cook using equipment, such as an oven, that we don’t have in our van. House sitting has also been great as we can leave our van parked up, and ride our bicycles into town for work. This has a bonus of exploring the local area even more, and also we save a few bucks each time by not using fuel to drive. The pitfall is that the vast majority of house sitting gigs also involve animal sitting too. While we definitely do love animals, being tasked to care for them can be problematic if the animal has any special needs, or if it is poorly trained, or doesn’t adjust to the new situation of us being there. We have had some great experiences with very well behaved animals which we quickly became good friends with, and other animals which were startled, escaped and left us having to look for them all afternoon to bring them home. We have also had to turn down a few house and animal sit offers as the animals had very high requirements for their care Examples include needing to be hand fed each day or having to have medication administered. So while house and animal sitting can be a great option for free accommodation and experiencing a new areas, it’s also something to be used with care and diligence. Poor communication and inadequate vetting can lead to some difficult situation that you are then committed to for the sake of the animals. Like most things in life, there’s no single clear-cut answer. 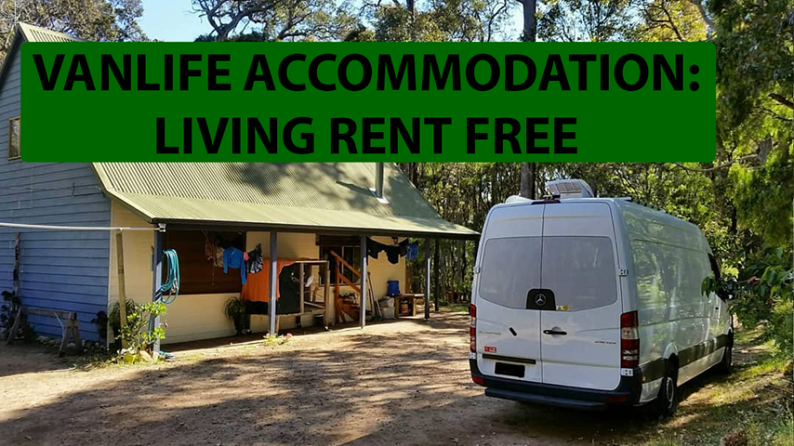 The solution for rent-free or very low rent accommodation will vary depending on your van, your needs, the area you are staying in, and what the local community is like. The most important thing to remember is to keep an open mind and look into all our options, or use a combination of options. Ultimately, travelling isn’t expensive. So if things really aren’t working out then it’s always worth remembering that your home is on wheels, and you can pack up and go elsewhere to try again. What’s your best solution for avoiding rent? Leave a comment below!